Once again I was a walker of rivers. Set off fairly early from the hut. All the other hikers were still in their sleeping bags, but the DoC ranger, who I had met the other day while he was gathering seedlings of an endangered bush, was up along with his older friend who had been out hunting deer the night before. A transcript of the first part of our conversation: “mumble mumble bloody mumble bloody bloody mumble mumble.” Apparently a translation of that is that he had killed a deer the night before and the younger man– the DoC ranger– had gone out to bring back the carcass. 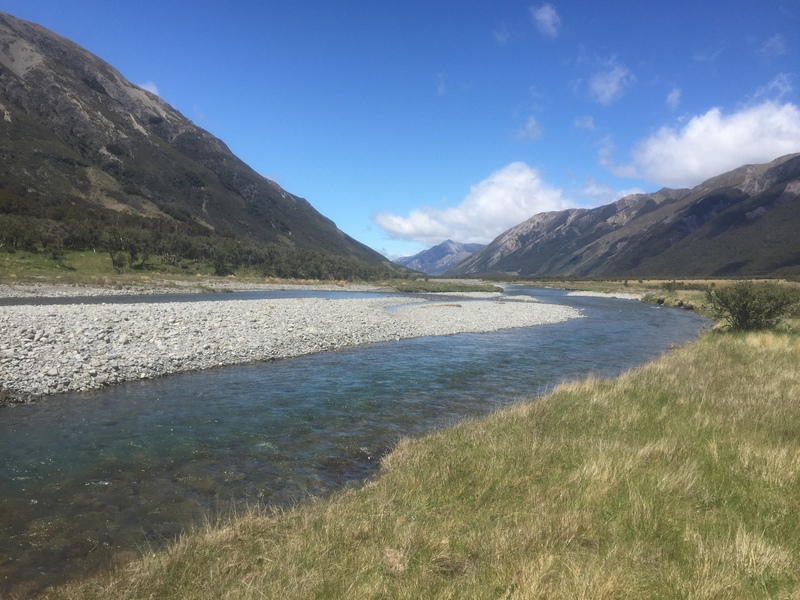 We ended up having a nice conversation in English before I set off on the day’s walk, a pleasan jaunt first up the main river valley but soon turning to follow the Anne River from its mouth to its headwaters at the Anne Saddle. There the waters parted, and I descended down for the rest of the day along the Boyle River into Boyle Village which was a ghost town. I walked through the Outdoor Education Center which is where I was supposed to stay, and also down the only other street. Not a soul to be found. The sand fleas were outrageous, and a quick check with the TA paperwork showed a shuttle bus to Reefton, a town not far away where I could resupply and sleep without be consumed by sand fleas, so I decided to go to Reefton, the closest town with a grocery store in case I could not get my parcel. Stayed in the Automotel, not the best place, but had a nice meal at the Alfresco Restaurant and got all my stuff together.